#12-03 Brunswick-Balke-Collender catalog from 1881. 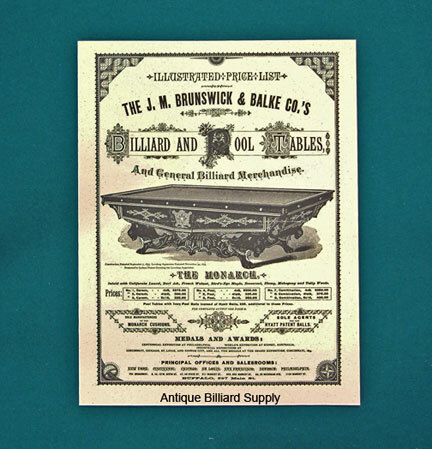 Reprinted in 1973, this high-quality reproduction of Brunswick's original catalog is printed on heavy paper and each page is ideal for framing. It features many tables, including the Monarch, Nonpariel, Eclipse and Exposition Novelty and lists original prices and types of woods used. It also shows the full line of unusual home tables, cue racks and ball racks that were available for sale at the time. Each of the 8 pages is about 13 inches tall, 11 inches wide. $25.